Universal Drum Dolly Provides Easy Mobility And Maneuverability Of Heavy Loads For Your Rubbermaid Commercial 55-Gallon Brute Containers. All-Plastic, Professional-Grade Construction Resists Rust, Chipping And Denting. 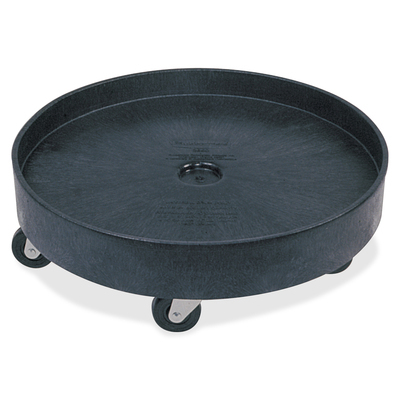 Five Heavy-Duty Wheels With Swivel Capabilities Allow Ease Of Mobility..
Universal Drum Dolly Provides Easy Mobility And Maneuverability Of Heavy Loads For Your Rubbermaid Commercial 55-Gallon Brute Containers. All-Plastic, Professional-Grade Construction Resists Rust, Chipping And Denting. Five Heavy-Duty Wheels With Swivel Capabilities Allow Ease Of Mobility.